When the Sun enters Libra at the Equinox of Maat, the days and nights are equal in length. Soon the days will be shortening and the nights lengthening as we, in the northern hemisphere, journey towards the winter solstice. In the southern hemisphere the situation is reversed; the days will be lengthening and the nights shortening, as the journey begins towards the height of summer. 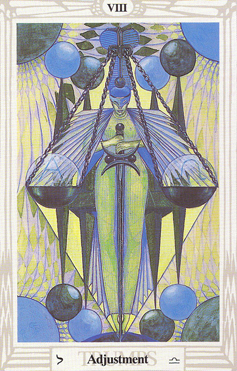 The Thoth Tarot trump for Libra is Adjustment VIII, depicting the Egyptian goddess Maat. A young woman is masked and bearing on her forehead the uraeus serpent. She is crowned with the ostrich plumes of Maat, and is perfectly poised upon her toes. In her hands is a magical sword, with the point downwards. She is The Daughter of the Lords of Truth, the Ruler of the Balance. She represents the absorption and transmutation of all experience in the flowing forth of continuous manifestation. She is the mistress of creation and destruction, and the balance of light and darkness. She is cosmic law, and the law of nature: truth, twofold, and the immutable law of the universe. Her powers are the works of Justice and Equilibrium. Let us find Ma’at in all things! Behold! I am the Eye of my father, Ra. I am the one in whom the word is accomplished. I am the Bride of Tahuti and the Measure of the Universe. I am truth, and the feather is my symbol. To pass my door, you must justify every part of your soul, and you must visit the beautiful fields of the grasshoppers. You shall bathe in the pool where the Sailors of Ra in his sun-boat bathe. Purify yourself in my name, and come before me as Horus Triumphant. For I stand upon one side of Ra in the ark of the heavens and Tahuti stands upon the other. And unless you have found the flint that is hidden in my furrow, then you shall not pass my gates. But if you know all these things, and if you have found me that dwells in the heart of Ra, and if you are pure—then Tahuti shall call your name! And you shall be known in the palace of the starry ones, and shall live forever and forever. Maat is the goddess that presides over the weighing of the heart ceremony, and is the ‘Straight One’, the principle of Perfect Truth and the Balance of the Universe. She is clothed in emerald green and wears the crown of double plumes. The feather is her symbol, and the Ankh of Life. Maat is the Eye of Ra, the Sun, and is the bride and consort of Thoth or Tahuti, the Egyptian Hermes-Mercury, the god of magick and of magick words and writing—the Word or Logos. The Neters or Gods are the personification of impersonal principles. Maat, especially, is a cosmic principle. The ancient Egyptians loved puns, the play on words. Maat says, “If you have found me that dwells in the heart of Ra…” One of the epithets of Maat is ‘The Me’, the Measure of all things. One must find the measure, the ‘me’ that is Maat, in the heart, the centre of all. Maat is the Eye of Ra, and the secret hidden in the heart of Ra—she is his daughter, and so the apple of his eye. As with students, a good pupil is as that which is in the centre of the eye. It is emptiness, yet beholding all—therefore receptive. Also it is one who hears—for the human ear was shaped by sound. The heart itself is the void place of spirit. The Egyptian hieroglyph for the heart (Ab) is a pot or vessel. The handles are the ‘ears’. The ‘eye’ is the emptiness inside—the necessary condition for true meditation. Nuit wears a pot on her head, which is the hieroglyph of her name, ‘Nu’; she is the Holy Graal. None, breathed the light, faint and faery, of the stars, and two. Everything concerned with Maat is double. The ancient Egyptians usually had two of everything, including pairs of male and female gods or neters. Maat presides over the Neophyte Hall of Dual Manifestation. Everything in nature is double; there is ‘no-one’ in truth. The power of Egyptian magical spells is in the words; to know they are true, and to speak them truly, is the perfection of Maat. There is a popular New Age notion that any affliction suffered in this life must owe to some ‘karmic debt’ incurred in a previous life. Let us dispel this myth, for the rule of Maat is not in any way a moral or ethical law. The law of nature is exact; we must not confuse this with any notions of human justice based on morality—if we do then we confuse this idea of karma and make little tin gods of ourselves. Furthermore, ‘reincarnation’ is a self-limiting modern myth, based on rationalist determinism. 1. The Oracle of Maat is taken from ‘Ceremonies of Nuit and Ra’, Ritual Magick—The Rites and Ceremonies of Hermetic Light [Ordo Astri]. 2. Oracle of Maat, Ritual Magick [ibid]. 3. See ‘Lapis Philosophorum’, Babalon Unveiled! Thelemic Monographs [Ordo Astri].